Leading superyacht accessories company FunAir – which is famous for its must-have superyacht slides – has launched a floating island at the Monaco Yacht Show. Building on the brand’s years of experience with superyacht inflatables, including some of the best water toys for children such as trampolines, pools and climbing walls, the floating island can easily accommodate three or more people making it ideal for family friendly yachts. Far more than your average lilo, the floating island features sun bed-style seating, side tables, a dipping pool and even a stable floor for easy exit and entry or to allow users to stretch their legs. With no detail left unnoticed, the floating island is yet another way for superyacht owners and guests to enjoy the luxury and style of life at sea. 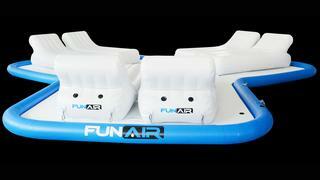 FunAir has also announced the launch of two further products – a jet ski dock and SeaStairs – at the Monaco Yacht Show. Both clear necessities to enjoy the superyacht lifestyle in its fullest, these toys are aimed at allowing users to gracefully enter and exit the water while adding a little fun to proceedings. As a principal sponsor of the Captain and Crew lounge, FunAir is giving those attending the Monaco Yacht Show the chance to try these new launches for themselves. First head to the Yacht Club where the new floating island will be on display before heading across the marina to MYS favourite Star ‘n’ Bars where you can meet the team and see what the fuss over the iconic slides is really all about.